Ever notice how whenever your friends post their adorable engagement pics, they always seem to have perfectly manicured nails? 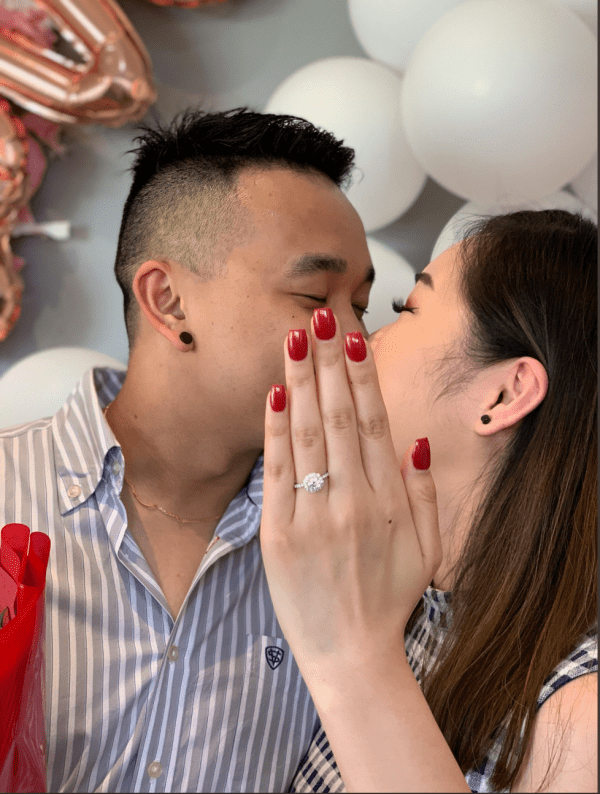 I actually know a few people who sensed that a proposal was coming soon, and they actually made it a point to keep their manicures maintained in case it happened. Well, if that’s a thing, I’d bet that putting off taking those “impromptu” pics until you can sit down with a bottle of nail polish probably is too. 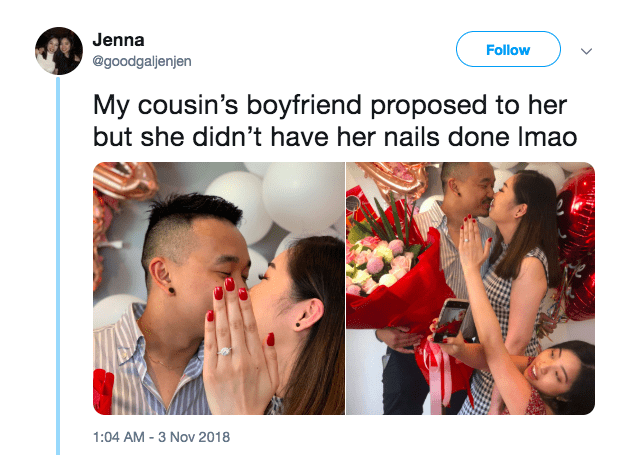 Well, if you ever get engaged and find yourself with fingernails not worthy of Instagram, you’d better hope you have a friend (or cousin) like Jenna here in your corner. 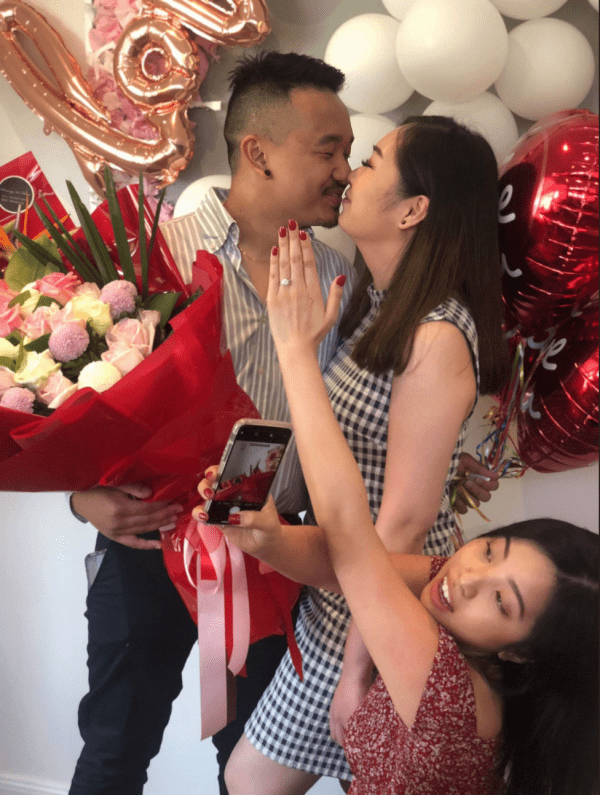 She was there when her cousin Diana’s boyfriend sprang the proposal (and Diana said yes) but then the girls debated what to do about taking a picture, since it had been a while since Diana had time to pamper herself. They talked about waiting while they painted (and dried) her nails, but in the end, were too excited – and Jenna had a better idea. She offered her own hand, pretty red manicure included. And honestly, the pictures turned out adorable – no one would have known had they not shared the full shot (which has now gone totally viral). The internet loved it, too, with everyone giving the girls a fistbump for solidarity and hoping that, when their time comes, they have someone like Jenna there to make the moment picture perfect.